We’ve still got a handful of the 2014 Giant Defy 5 model road bikes in stock. Originally retailing at £500, they are now just £400. 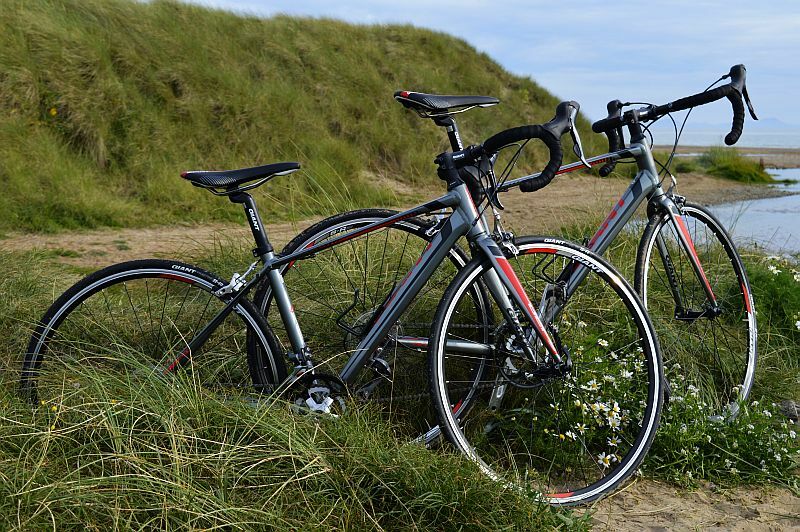 A number of these bikes have been allocated as hire bikes at the new Brooksbank Cycle Circuit and we decided to test them in training on the new circuit and out on the open roads during a recent visit to Wales. Straight out of the box, these bikes feel great and once we’d popped our pedals on them we took them for a spin on the super-smooth Brooksbank circuit. Alongside some vastly more expensive bikes, the Defys held their own very well, with a precise handling and a the feeling that they responded well to rider input. Modern, wide bars and upright riding position meant that rider comfort and control were not a problem. Despite being very much made to a budget, the wheelset and tyres look like they are from a higher spec bike and typically for Giant, performance seems to have been put high up the priority list. A compact chainset took care of a couple of hilly coastal rides in North Wales, where again the solid handling and braking characteristics gave you a lot of confidence on some less than perfect surfaces. If there was an obvious area for upgrading, it would be the Shimano Claris groupset, which was perhaps a little clunky next to the slightly higher spec versions higher up the Defy model range. But, overall, we loved the Defy’s outstanding all-round capabilities. Whether you’re looking for a budget road bike for training and sportive use, or looking to add a first road bike to your stable of bikes, we think you’ll be hard pressed to find better value for money. We still have a few of these bikes in stock – call in or give us a ring to find out more. This entry was posted in Latest News on August 29, 2014 by pedalsportclub.